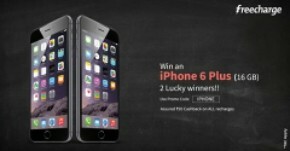 Here is new Freecharge Promo Code to win an IPhone 6 plus and Rs 20 assured cashback. 1) Use any freecharge app ( android, windows or iOS ). 2) Start recharging with 20 Rs and apply promo code IPHONE. 3) Rs 20 cashback will be credited within an hour. 1) Minimum recharge amount should be 10 Rs. 2) Offer expires on 22 October 2014.